At Manchester Science Festival in 2016 I teamed up with artist and graphic designer Nick Sayers to run cycling tours of the solar system – from the Sun to Neptune – along a 4.5-km section of the Fallowfield Loop cycle path in Manchester. The weekend was a great success, with all tours fully-booked, and lots of really enthusiastic cycling-astronauts of all ages. So when I saw a call for projects at the Story Of Space festival in India, it seemed like a good idea to pitch the project. The Story Of Space was organised by a team from The Story Of foundation, who put in huge amounts of effort to secure funding, sponsorship, volunteers to support the festival projects, and all manner of other things, all in addition to their “normal” jobs. The festival ran from November 10th to 19th 2017 across several locations in and around the city of Panjim in Goa, India, and everything in the festival programme was completely free to attend. 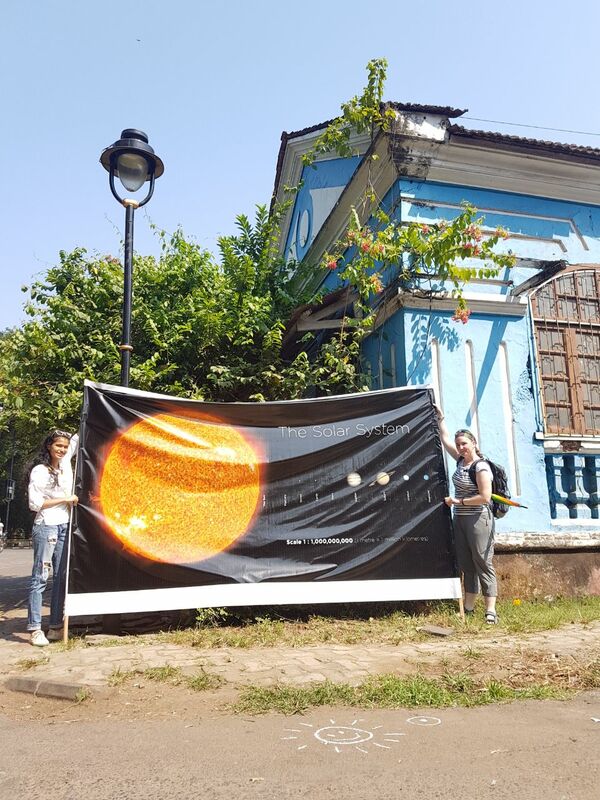 November 2017 saw a huge number of artists and scientists converging on Panjim to create numerous installations, and Cycle the Solar System was one of the proposals selected to be part of the festival! Cycling in Manchester is something of a risky business. I lived in the city for six years and did a lot of cycling; it is great to see today that more cycle paths are being constructed, but it still feels something of a risk heading out on the roads. Despite this, nothing quite prepared me for the “excitement” of cycling in India at rush hour. (If you’re into extreme sports and adrenaline, give it a go.) Despite the buses, cows, trucks, scooters, deep gutters, hidden wheel-sized holes, trees in the road (etc), we didn’t loose a single astronaut! Over ten days we ran eight tours of the solar system on a scale of 1:1 billion, each running over 4.5 kilometres starting from the Entertainment Society of Goa, past the Sun at the malaria centre, the inner planets alongside Luis Gomes park, Jupiter near Campal Ground, Saturn near Miramar circle, Uranus south of Goa Science Centre, to Neptune (appropriately) at a fish market just short of Dona Paula jetty. The route ran along a main road so, as the astronomer tour guide, I spent the best part of three hours talking over traffic. Combined with the dust and the air pollution, I almost lost my voice, but not quite. Along the route we stopped at the Sun, each of the eight planets, as well as the asteroid belt, and in the outer solar system for ice cream comets. To aid with the sense of scale, our model included flags with images of each planet (at the correct scale), as well as locally-sourced (mostly-) edible props to make it more memorable. In our model, the Sun was a stripy golf umbrella, Mercury was a peppercorn, Venus and Earth were represented by whole nutmegs, Mars was a dried chickpea, Jupiter was a green coconut, Saturn was a regular coconut with a frisbee for the rings, and Uranus and Neptune were a local root vegetable that we never actually found out how to cook! 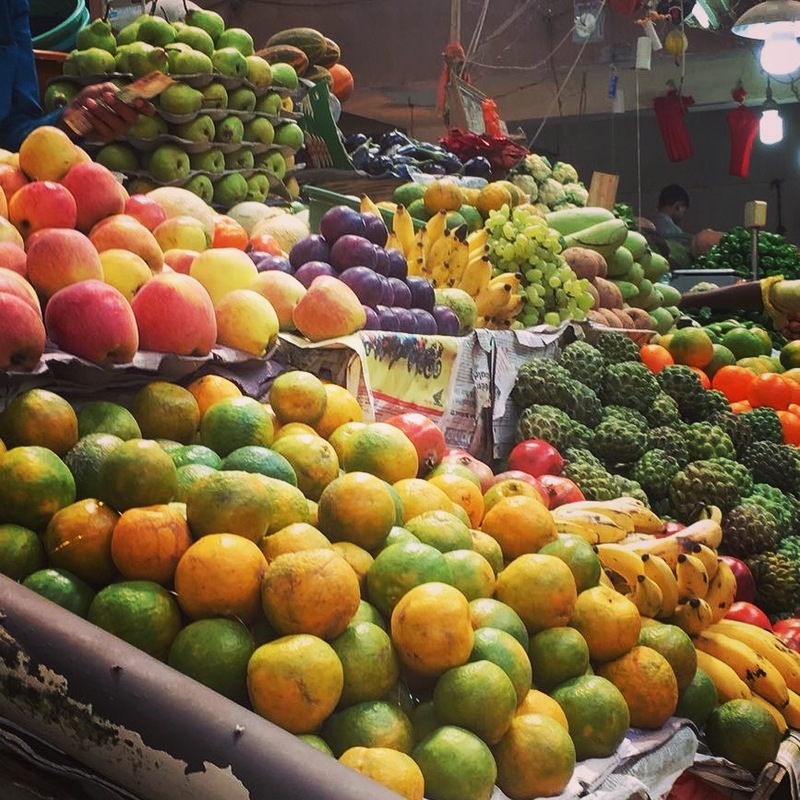 To get props that were the right scale we spent a morning at Panjim municipal market, measuring all the fruit and veg with a tape measure… the stallholders were thoroughly confused by the eccentric English people and their odd habits. “It’s ok, it’s for science!” didn’t quite have the reassuring effect we had hoped! 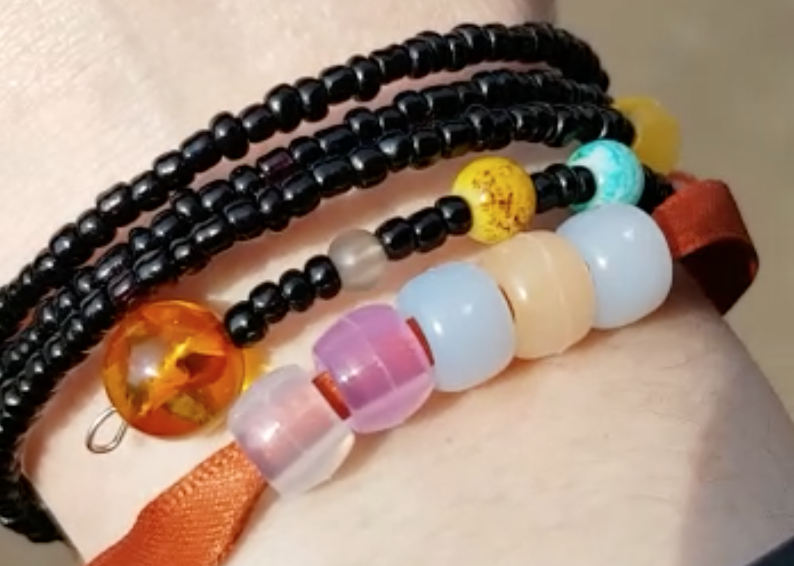 Miniature solar system bracelet and UV-beads. As well as the scale-model props, I also added a miniature solar system scale model in the form of a bracelet made by Emma Wride of AstroCymru, which was useful for giving an impression of the distances between the planets before we set off on the bikes. I also made use of some UV-beads from Helen Mason, illustrating (along with our rainbow-coloured umbrella representing the Sun) that the Sun emits radiation in parts of the spectrum that our eyes just cannot see – for some of our interplanetary astronauts, this was the first time they had come across this concept. The days were long, the traffic was scary, but it was all worth it. 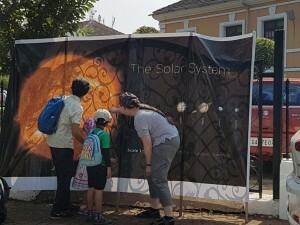 The groups that came on the tour were all different, from an international school in South Goa, people from AFA, the local astronomical society, to local college students, families, and adults from all sorts of backgrounds, so each tour had its own unique character. 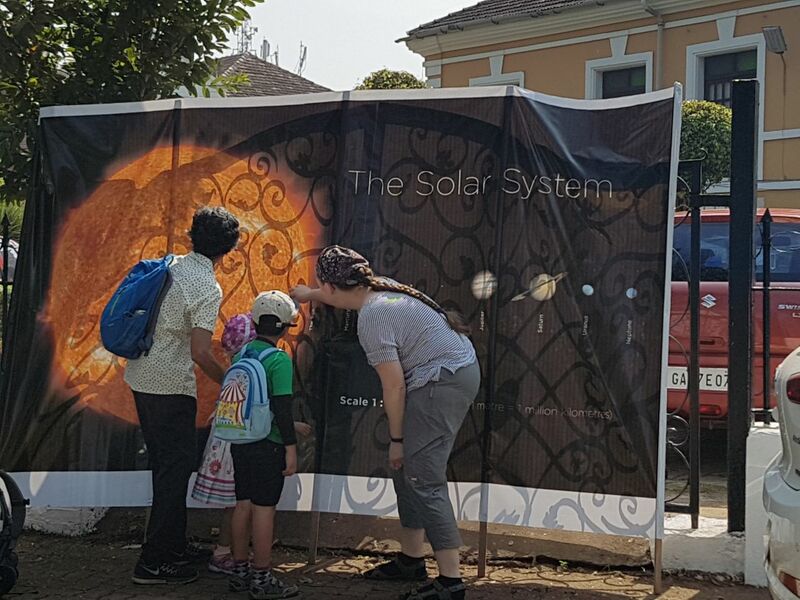 Everyone went home happy though, having gained an impression of the immense scale of our solar system and the huge distances between the planets, relating the distances to memorable local landmarks. As the tour guide, I tried to present a few interesting facts about each planet, but each tour was largely driven by the questions from the audience; people can get as many facts as they like from books (or wikipedia), but the shear scale of the distance between the planets is something that is much more difficult to comprehend, and that – for me – was the main point of the tour. As a scientist at a (mainly) arts festival, I found myself among a very creative and open-minded group of people. As a scientist I found this refreshing, and as a science communicator I found it inspiring. The more I talked with the artists at the festival, the more we found we had in common. These crossover conversations culminated in a panel session on art-science collaborations, where five of us enjoyed debating how and why these kinds of projects work in front of an audience at the Goa Science Centre. Cycle the Solar System goes to the Miramar Circle food market! The world of science is phenomenally exciting: doing good science requires much more creativity than most people realise, and communicating science is an inherently creative endeavour. 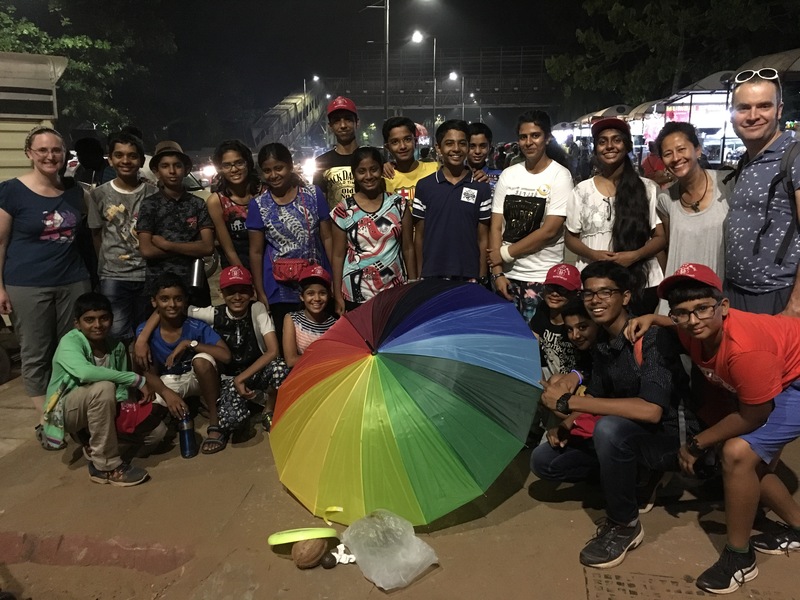 I left Panjim with many new ideas that I look forward to trying out and using in my own work, I hope everyone else (scientists, artists, and visitors) went home similarly inspired. Huge thanks to The Story Of Foundation for making it all happen, to our amazing helpers (particularly Namrata and Sejal!) and to the RAS and OAD for funding my participation.